Do you take digital photos and would you like to quickly create a file with thumbnail size versions of photos from a trip or family event? This file is called a contact sheet. Professional photographers commonly want to create contact sheets of all photos from a wedding or other photo shoot. Here are a couple of ways to create a contact sheet if you use a Mac. If you use Photoshop, it has a built-in contact sheet creator feature. This is the easiest way, but it requires Photoshop. You’ll be prompted to select a folder containing photos. Do this and then let Photoshop do the rest. It’ll create a PDF of all images with the file names listed below the image. If you don’t have Photoshop then give this method a try. I have tried this on 4 Macs and it worked on two of them. I’m not sure why it failed to work properly on the others. The following instructions will create a PDF of all images that you have in the folder that you select. You could then annotate the PDF using Preview to add captions below each image. Click on the Go menu and select Applications to see the items in your Applications folder. Click on Service as the type of document. Use the image below as a guide when following these instructions. In the left-most column, click on PDFs. In the column to the right, click on New PDF Contact Sheet and drag it to the right. 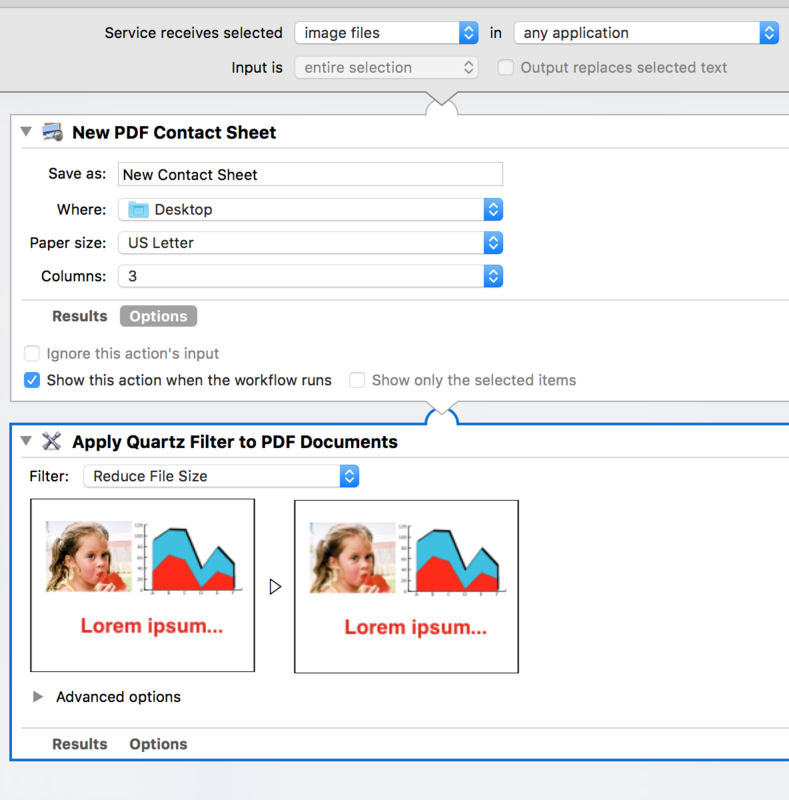 In the same column, click on “Apply Quartz Filter to PDF Documents” and drag it to the right. You’ll be asked if want to add a “Copy Finder Items” action. You do not want to do this so click the “Don’t Add” button. Click on the File menu and select Quit Automator. 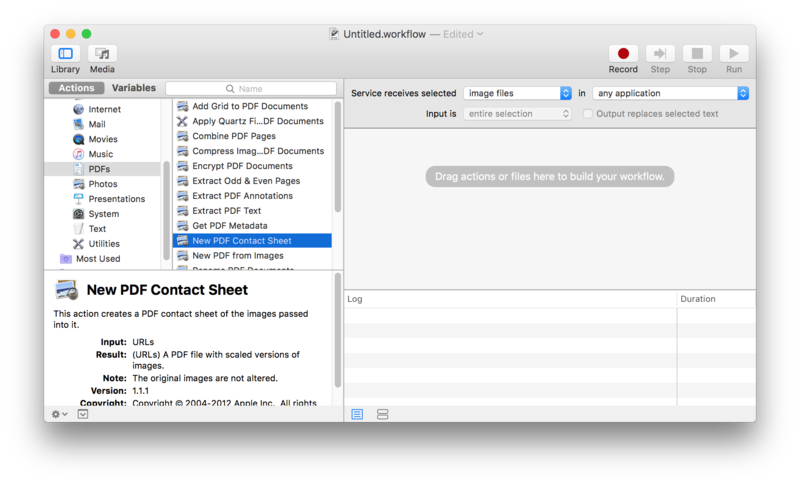 Now, let’s test our Automator workflow. In the Finder click on a folder containing a bunch of digital images. Click on the Finder menu, select Services and pick your workflow. You should be prompted to name your contact sheet and pick a destination for the resulting PDF contact sheet–the Desktop is the default. If you change the number of columns from 3 to either 4, 5 or 6 then your thumbnail images will be smaller. Click the Continue button and wait for the PDF contact sheet to be produced and saved. Locate your contact sheet and open it to check it out. Read more about contact sheet, create, how to, mac, PDF.